Indonesia’s monetary unit is the RUPIAH (Roo-pee-ah) symbolised as “Rp”. Like Dollars, rupiah are written “Rp 1,000” but said “1,000 Rupiah”. 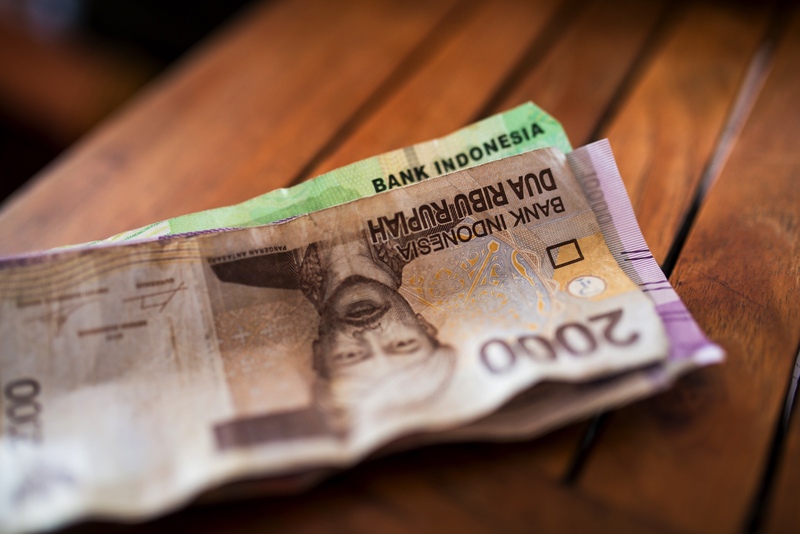 Some tourists refer to “Rupes” when speaking English, but when speaking Indonesian you should only say “Rupiah”. Recently one Australian Dollar was worth just over Rp 10,000. The rate fluctuates daily so only change enough for a few days. The US Dollar has varied considerably over the last few years, trending down, but the recent exchange rate was around Rp 13,000. It is a good idea to always carry plenty of small change. This means carrying lots of Rp 1,000 coins or Rp 5,000 notes to pay for small things such as drinks, snacks, taxis, parking. In a country where the basic wage is around $5 a day, it is understandable that few people have change for large notes. When exchanging money ask for Rp 5,000, Rp 10,000, Rp 20,000 or Rp 50,000 notes. Try to avoid the larger Rp 100,000 and Rp 200,000 notes if possible as they are harder to get change from. Indonesia now has many ATM machines that accept most international Credit and Debit Cards. Check with your bank if your card is compatable with ATMs in Indonesia. Some ATMs have a maximum limit of Rp 600,000 (around $50). You can get larger amounts by doing a few transactions through the ATM, or from over the counter within the Banks. ATMs are fast and convenient, but safer to use in the day time rather than waiting till late at night. If cashing Travellers Cheques or exchanging notes inside a bank, remember to take a photocopy of your Passport as ID. Previously travel cheques were the most common way to carry money, but ATM cards have fast taken over. We recommend you avoid all small Money Changers as they often have “rigged calculators” and are renowned for dishonest sleight-of-hand tricks. Even bringing your own calculator doesn’t make it foolproof - you will invariably get back to your hotel to find you’ve somehow been short-changed “as if by magic”. Don’t let the staff touch your money after it is counted by you. It is best to use Banks or large authorized Money Changers instead, even though it may cost you a dollar or two more in Commission. Whenever you leave your hotel, during the day or night, only carry as much money as you think you will need for that trip, plus an extra 10 x Rp 100,000 notes in case of any unforseen emergency ($100). Never carry your Passport or other valuables, leave them locked in your safe.